Home » News and Stuff » Uncategorized » Chocolate Extinction?? The New Year has seen lots of reports of an imminent ‘Chocolate Extinction‘!! Google it yourself and see what is happening. 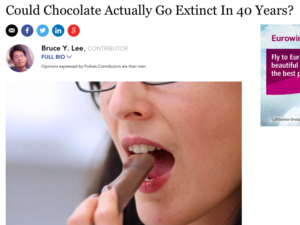 Maybe the Chocopocalypse is real after all. Maybe my story is coming true!!! !